The Garst Museum started out in 1852 as an inn. Its location near the rail line provided a steady source of patrons. In 1946 Mrs. Nellie Garst Menke donated her home to the Fort Greene Ville Chapter of the Daughters of the American Revolution. With this acquisition, the DAR decided to request help from the Darke County Historical Society. It was a marriage that proved to be exactly what was needed. Each year more and more people visit. In 2007 they reached over 10,000 visitors and have their eyes set on greater numbers in the future. The Garst Museum presents large displays of hometown celebrities like Annie Oakley, Lowell Thomas and Zachary Lansdowne. They have gathered collections of Native American artifacts as well as military exhibits from the Indian Wars to modern warfare. With Greenville being the Treaty City the museum has examined Fort Greene Ville and the Greenville Treaty with great detail. Born in Greenville Ohio on 1 December 1888, he entered the service in the United States Navy. Graduating as a Navy officer in 1909 his service began on the battleship USS Virginia and then on the destroyer USS McCall. Lansdowne trained in Naval aviation and then on England to be trained in the flight of dirigibles. He would spend the remainder of the War in this service. In 1919 Zachary Lansdowne served aboard the airship R-34 in its flight from England to America. Early in 1924 Lieutenant Commander Lansdowne took command of America’s new airship the USS Shenandoah. He would become well known throughout the nation and capture the imagination of its people. Killed on 3 September 1925 at the controls of the U.S.S. Shenandoah and is buried in Arlington Cemetery in Washington DC. 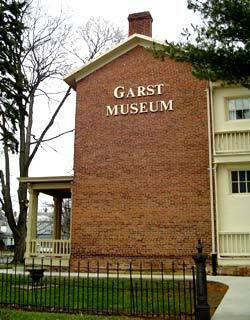 Greenville Ohio still honors its son and has dedicated a portion of the Garst Museum to his memory.